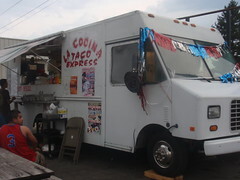 This truck was first located in the winter of 2009 next to a building where you could sit inside to eat and have access to a salsa and condiment bar . This is useful when there is snow on the ground and it is 30 degrees. The coolest thing about this truck is that they have a wire from the truck to the door of the ‘dining room’ and when your food is ready they pull the door open and call you to come and get it. We weren’t enamored with the food that we had. Definitely far from the best lengua. who needs to drive when you can cook? This truck received a yellow sticker from Columbus Public Health in their most recent inspection. Not surprising based on our visit and not one of our recommended trucks. the food here is very good and the sticker from the inspection was for a broken thermometer in one freezer. I’ve been eating at this taco truck almost every week since April or 2007 and have never had a problem with the food. Fast and delicious! I have been eating at this taco truck for 2 years and have never had a problem with any of my food . there are a few trucks that i have been to and will never eat at again. But i love the tacos from this truck. I have got my family eating tacos from this truck. I go there almost 2 times a week. there tacos are so good.